* Received from the publisher for review. Kylie Galen thought that she was just another normal teenage girl--well, asides from having to visit the shrink and her personal stalker (affectionately known by Kylie as "Soldier Guy"). However, after her parents announce their divorce and Kylie gets caught in a drug bust, she finds herself at Shadow Falls Camp. More importantly, the kids at camp give a whole new meaning to weird; they're supernaturals. Suddenly she's rooming with a dyslexic witch (Miranda) and a half-asian vampire (Della), denying the fact that she might be a supernatural too--and one that can see ghosts at that--and two of the cutest boys at camp are interested in her. If you're like me, you're wondering just why it's called Born at Midnight and the reason is pretty straight forward; most supernaturals are born at midnight (Kylie for example). Kylie spends most of Born at Midnight trying to figure out what she is and truth be told, although she gets closer to the answer, she's not quite there yet. Hopefully Awake at Dawn will give us some more answers in October of 2011. Then there are the boys. We have Trey (Kylie's ex-boyfriend), Derek (who looks a bit like Trey and is part fae), and Lucas (a werewolf and someone Kylie has met before). Trey is somewhat of a prick, Derek is a very nice guy, and then Lucas is someone Kylie is somewhat afraid of (at least at first) due to their past--it involves a dead cat--although she's also drawn to him at the same time. Of the three, hands down, I'd tell you that I like Lucas the best although Derek is a close second. For Miranda, there's Perry whom uses his shapeshifting abilities to sneak around and well, no one really for Della at camp (although there is a boy back home). Ah, but then we have my favored pairing of Holiday (Kylie's mentor and a camp councilor) with Burnett (a FRU agent/vampire who butts heads with Holiday--often). Seriously, maybe I'm just weird like that, but I always like it when characters start out hating one another like that. Will anything actually come of that relationship? I have no idea--but a girl can hope! If you're looking for a read that's in a unique setting and has a very interesting cast of characters, I'd suggest checking out Born at Midnight if you haven't already. I would like to gently remind you though that there are no concrete answers in Born at Midnight as it is the first book in a series. On the upside, you only have to wait until October of this year for the second book--Awake at Dawn. 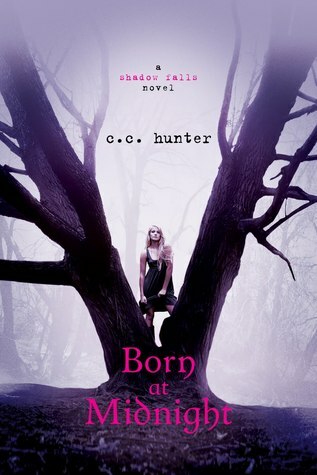 So, if you've already read Born at Midnight, who was your favorite character and/or favorite character relationship?